The story Trump was referencing claimed people close to him said he was losing confidence in members of his legal team because of their handling of the Russia investigation. The story also said Trump met with former President Bill Clinton’s impeachment lawyer, and was considering hiring him. Trump’s team has wavered on how much to cooperate with the Mueller probe, but has recently been doing everything in its power to stop Trump from sitting down for an in-person interview. President Donald Trump lashed out at one of his favourite media targets, The New York Times, in a pair of tweets on Sunday in which he pushed back against a story the Times published alleging he was dissatisfied with his legal team’s handling of the investigation of special counsel Robert Mueller. The Times story reported that Trump is in talks with Emmet T. Flood, a lawyer who worked on former President Bill Clinton’s team as he navigated the investigation that eventually led to his impeachment in 1998. It also mentioned several unnamed sources who claimed Trump was losing confidence in his lawyer Ty Cobb. Trump said the story, written by Maggie Haberman and Michael S. Schmidt, was “purposely” false. 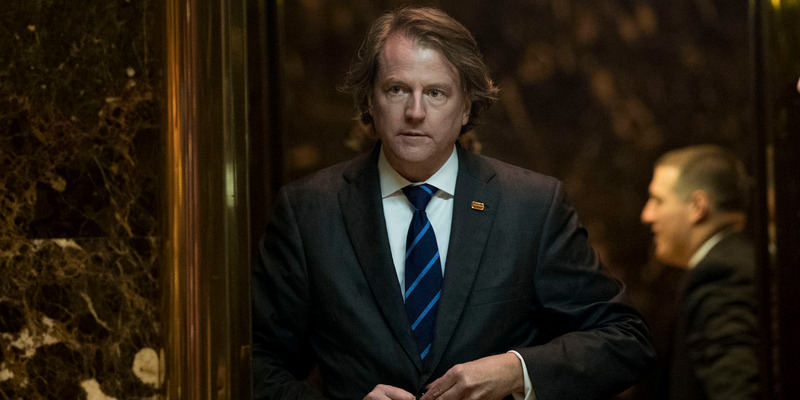 Although the president and his staff have expressed confidence in Cobb in the past, The Times reported that Cobb has recently clashed with one of Trump’s other top lawyers, Don McGahn, and Trump is apparently looking to change up his staff. McGahn has frequently been a moderating influence on Trump, and reportedly persuaded him not to fire Mueller last year. But he has also butted heads with Cobb over how much Trump should be cooperating with the Mueller probe. In the second tweet, Trump called out Haberman directly. Haberman used the moment to further reinforce her story’s legitimacy and to analyse what Trump’s response meant for his legal team. Drew Angerer/Getty ImagesDon McGahn, one of Trump’s lawyers. Trump’s lawyers have at times urged the president to cooperate with the Mueller investigation, but have also pursued a number of dubious strategies in order to keep him from testifying before the special counsel. Among them is the argument that having him sit-face-to-face with Mueller would be a waste of time and would set a bad precedent for future presidents. In addition, Trump’s team has floated the possibility that they would agree to an interview only if Mueller agreed to conclude the probe within 60 days or limit his questioning to a narrow scope of inquiry. Trump’s team’s efforts to stonewall Mueller have also raised the possibility of a Supreme Court battle and lengthy negotiations that could take months. But legal experts like Robert Ray, who was one of the independent counsels in the Clinton investigation in the 1990s, said Trump will have to sit down with the investigators sooner or later. “The sooner they make the president available to submit to an interview, the faster that Bob Mueller can get to the finish line and be over and done,” Ray told the Wall Street Journal last month.